History may not repeat but it sure does rhyme. Mike Maloney has studied monetary and financial breakdowns throughout history and concludes that there’s nothing new or different happening this time, except its global and far more massive than any other time in history. Worse, there are echoes of 1911 where a series of diplomatic blunders and national pride and intransigence combined to create the still largely inexplicable start to WW I.
Chris Martenson: Well it’s global this time, right? This is — there’s nowhere to hide. (…) What has happened when we’ve tried to print our way to prosperity before? What has happen? Why has it happened and what have been the consequences always been? 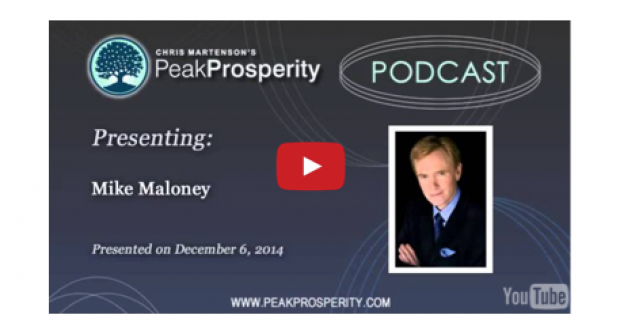 Mike Maloney: Whenever you try to print your way to prosperity it transfers well from the masses to the few. The few being the people running the game and then also the hucksters that are very nimble, the con artists and so on. You see these people get rich during the Weimar Hyperinflation. There were quite a few of these fancy salespeople that got rich; they didn’t stay rich once things stabilized again. But it creates such a topsy turvy world that the normal person that does not know how to operate under these weird economic conditions cannot possibly keep up with things and wealth is transferred away from those people to the people that are very good at observing what’s going on that second and adjusting to it. But the one thing that I see as a constant throughout history is that gold and silver eventually do an accounting of all this — the financial — you know financial finessing that the governments are doing. And when it does that it — there is a transfer of wealth to the people that own gold and silver. And so — it’s very rare moments in history. This does not happen often. But it’s a great opportunity and I’ve just — you know if you look at gold right now the public’s opinion of gold is quite low because it’s been going down for three years.